Moffatt Lamps are the standard for machine-mounted lighting for all sorts of operations. A bright conical reflector puts the maximum light where you need it. Use up to a 100-watt bulb (not included) to see better - and work better. The revolutionary aluminum heat sink surronds the bulb base, drawing away heat from the recessed switch and socket. Lower temperatures mean longer bulb and lamp life in spite of the 100-watt capacity. The uniquely designed air space between reflector and shade keeps the durable Lexan shade cool to the touch. The lamp shade rotates 1½ times around, and the base allows unlimited rotation. 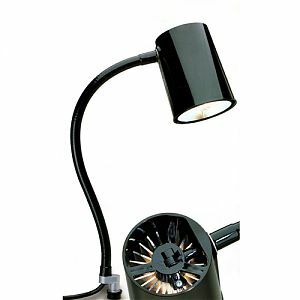 No matter how a Moffatt lamp is mounted, or in which direction it is bent, you'll light you work from left to right, above or below, with no strain on the heavy-duty flexarm. A vinyl covering keeps dirt and grease from weakening the flexarm. Standard flexarm is 24". The quick-connecting coupler allows easy mounting or moving no matter which mount you choose. Lamps come equipped with 3-wire plugs on 6'-long power cords. Available in Gloss Black only. Three standard mounts included with every lamp MLMS1, MLMS2 and MLMSRA. See Moffatt Lamp parts for additional base types.